The Deputy Minister of Infrastructure, Transport and Network of Greece, Ms Marina Hrysoveloni, visited the Greek Centre, on Wendesday 12 October, together with the Greek Ambassador Ms Ekaterini Xagorari and the Consul General of Greece Ms Christina Simantiraki. 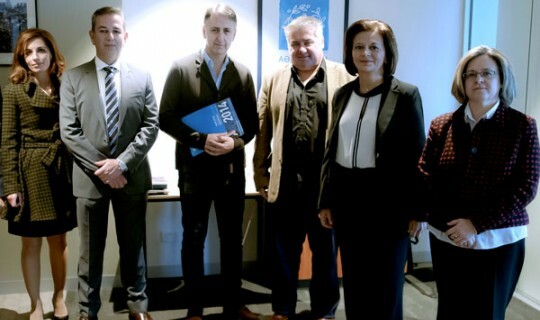 At the Greek Centre she met with the president of the Greek Community of Melbourne (GCM) Mr Bill Papastergiadis, the Board members Mr Jim Bossinakis and Mr Chris Sikavitsas and the director of the Greek Centre Mr George Menidis. During her tour of the Greek Centre she was informed about the activities of the GCM and discussed various issues concerning the organisation and the diaspora.